Now every kid can have their ice cream and eat it too! Ingredients: Potato starch, tapioca starch, palm oil, evaporated can juice, water, dietary fibres, emulsifier (lechithin), cocoa powder, xanthan gum, salt, baking powder. Like everyone else has said, they taste like regular cones. They are fantastic. These are really yummy. My 5 and 3 year olds love them. Like previous reviews, they taste like non-gluten free ones. I started buying 2 boxes at at time because we go through them so fast. Kids just eat the cone as a snack. Love these - would not know they are gluten free as they taste just like the non-gluten free ones - delicious! Great for celiac people. Got these for my Dad and he thinks they are great! You get quite a few in a package as well! 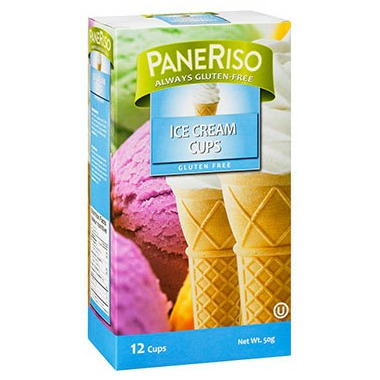 My daughter and I have food sensitivities and was buying these at a large grocery store but they haven't had them in stock since last year....summer time = ice cream so I buy them here now! They taste great and the kids don't notice anything different. Love these. They are more fragile to fill than regular ice cream cones but taste great. Great gf product - tastes exactly the same! This gluten-free ice cream cone is lighter and better tasting than ordinary ones. It doubles the pleasure of eating ice cream. I will definitely purchase this product again. Really good, and as far as I know the only gf cone on the market. The same company used to make the gf sugar waffle cone. I can't find them anymore, too bad, they were delicious! Our daughter has celiac disease, so we bought these to try out. They taste exactly like the regular cones. We quickly ran out and had to order another box! Agree with everyone - wonderful to be able to have an ice cream cone again and not sacrifice taste as you have to do with other gluten free products. Nice and light and crispy but pretty fragile, be careful with them! I broke one when filling it with harder ice cream. Another Gluten free product that tastes better than the 'other ones'. Stays crispy - excellent product. Bought them for my grandaughter and she just loves them.Tried them myself and I agree. Nice and crunchy... just as good as the wheat kind. We love these cups - crispy and taste great! They maintain their texture and don't get soggy with the ice cream inside! I like these ice cream cups even better than the ordinary ones. They have a great flavor and are very crisp. These are great. They melt in your mouth, so good! These are as good as any store bought cones and fresher than some. I appreciate being able to treat my daughter and young granddaughter like everyone else. Delicious! They break easily, but so do all cones; taste almost the same as regular cones. Not just for kids for adults too, love them. Yummy and who wants to live without a ice cream cone in the hot summer?